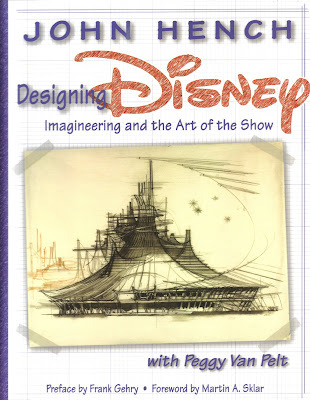 Many books about Imagineering spend a lot of time talking about engineering and show. They refer to art, but it is typically just the display of concept art. 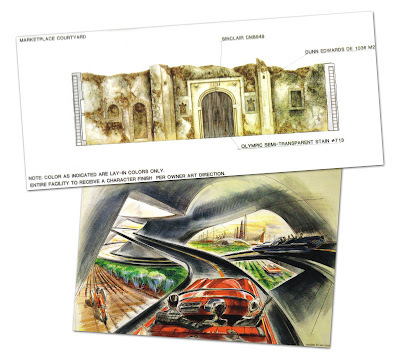 John Hench's book Designing Disney: Imagineering and the Art of the Show takes a different angle on design of the theme parks. This book focuses on art, but does more than just show pictures. Hench delves into the world of artistic design and the role that the choices of the artists play in capturing the sense of place that we have all come to love in the parks. Designing Disney is a true gem. Throughout the book, Hench describes the thought process of an artist -- the challenges that are faced, the decisions that must be made, and the how's and why's of various design choices. A large focus of the book is on the use of color. There is a whole section of the book dedicated to it, and many other references throughout. It is amazing to learn about all of the feelings and emotions that the Imagineers can generate in you without you even knowing it -- and they can do much of it just by choosing the right palette of colors. After reading this section, you won't look at the Disney parks (or maybe anything) the same way again. Hench illustrates his points with many examples. He describes the color design that went into the American Adventure pavilion -- four colors of brick and three shades of white. He goes on to explain how colors must also interact with their surroundings. They must be adjusted for things like the quality of light from the sun or light reflecting off of nearby grass. The book also explores many other facets of design including the use of wienies, the role of characters, setting time and place, creating moods, and avoiding contradictions. Hench explains how design choices can trigger subconscious feelings and emotions to rise out of individuals by creating new places that are somehow familiar and reminiscent of experiences we have had before. The stories in this tome range from designing Disneyland through Animal Kingdom, the Disney Cruise Line, and as recent as Mission: Space. A little background about the author... John Hench joined Disney in 1939 at the studio. His artistry can be seen in many classic animated features such as Cinderella and Peter Pan. He is also did special effects work for such films as 20,000 Leagues Under the Sea. He moved on to Imagineering and worked on everything from the original Disneyland Tomorrowland to Hong Kong Disneyland. The Verdict: This book is a must for fans of theme park design. If you already own the Imagineering Field Guides and Walt Disney Imagineering: A Behind the Dreams Look at Making the Magic Real, then this will make a great addition to your library. It has a truly unique perspective on the design of the parks that is unmatched by other books. Jonh Hench was amazing and we would not have the theme parks, as we know them today, without him. Since he has passed away, this book is going to quickly escalate in price. I just finished the book a few weeks ago. Excellent read!